Omaha Hi is an increasingly popular variant of Poker. 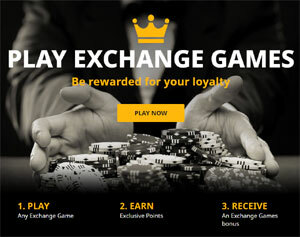 Betfair Exchange Omaha Hi works in a very similar way to Exchange Texas Hold'em. You have the same opportunity to watch and bet on a game of Omaha Hi, changing your bets as the game unfolds, but in addition to just betting on the winner, you can also take advantage of the side bet market, which allows you to place bets on the ranking of the winning hand! And you can do this at all stages of the game - pre-deal, after the deal, after the flop and after the turn. Although you're not playing the game yourself, a little Poker knowledge would be helpful in making informed bets. It's beyond the scope of this page to go into great detail about Pot odds etc and there are many articles out there that can fill you in with as much detail as you need. However, we'd highly recommend getting thoroughly familiar with standard Poker hand rankings: What beats what in Poker? Each game begins with 21 cards being dealt face down from one randomly shuffled pack. 16 of the 21 cards are grouped in fours to form 4 separate hands as displayed on the site (these cards grouped in fours can be known as 'hole cards'). The remaining 5 cards form a pool of community cards. Each hand must consist of two hole cards and three community cards. This gives you a lot more betting options - remembering that you can always bet for (Back) or against (Lay) any particular bet. Before any cards are dealt, there is an opportunity to bet for (Back) or against (Lay) any of the hands. As no cards are visible, there's no strategy at this stage, it's more a matter of taking a punt and choosing one of the available options as a pure gamble - taking advantage of the fact that at this stage all players have an equal chance of winning, so you could be lucky and plump for what turns out to be a winning hand, even before the pre-flop! The exchange reflects this, in that all Hands are showing at odds of 3.95 (approx 3 to 1) to Back and 4.05 to Lay. You have 25 seconds (20 in Turbo edition!) to make up your mind and bet! Each player is dealt 2 unique cards to start. At this point the betting switches to in-play. With even a basic understanding of Poker, you can do the Maths and work out the probabilities of each hand winning. Again, you have an opportunity to bet (Back or Lay) on each hand. In the example to the right, you'll seed that probability suggests that Hands 2 and 4 have a slightly better chance of winning - the exchange odds change to reflect this. You might want to go with this and Back Hand 2 or 4, or you could take this opportunity to Lay Hand 2 or 4, hoping to attract money. As we'll see, this can be quite profitable! The three community Flop cards are now revealed and the odds of each Hand winning start to change. Depending on the Flop, each player's chances of winning are increased or decreased and the exchange will reflect this. This is another chance to make an informed bet, based on your knowledge of the game - bearing in mind that other punters may not have the same expertise! You'll notice in our example that Hand 4 has now drifted to 6.1, whereas Hand 2 has hardened to 1.68. This is your last chance to bet on this game. As the Turn card is dealt, the situation begins to get much clearer. Players are now eliminated and the odds begin to separate. This is now your chance to make your biggest bets - remembering that you can Lay a result as well as Back it, giving you the chance to play safe and go for the obvious or bet big on an outside bet, hoping to clean up! The River card is revealed and the game ends. At this point, all matched bets are settled. You'll see in this example that the winner is Hand 1, which at the Flop had odds of 6. If you'd Backed Hand 1 at that point, or Layed Hand 2 at the Turn, when it was down to 1.51, you could have cleaned up! That's the great beauty of exchange betting - you get to pit your wits against other gamblers, not just the casino! Once all bets are settled, the next game begins - there's a game every few minutes, 24 hours a day, so you never have too long to wait! If the above has whetted your appetite, and you'd like to give Exchange Omaha Hi (or any of the other Exchange Games) a spin, just click on the link below and we'll take you straight there!